Dear Families, My name is Aline, provider of live-in childcare. 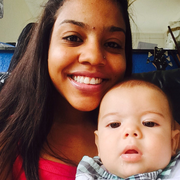 I have more than 4 years of childcare experience in Brazil, plus 2 years as Au pair taking care of 2 kids in NY. I would love to have an opportunity to take care of your infant as well. One of the things I like the most about this job is the possibility to provide personalized childcare. I am responsible, patient, creative and I love to be with kids. Reach me out for an interview. I will be thrilled to know more about your family and answer to your questions. Qualification/Skills: More than 4 years of experience reference upon request Au pair training school, International driver's license (valid in more than 60 countries) and NJ driver's license, Clean driving records, Tutoring with schoolwork Cultural diversity, First-aid and CPR and certified Degree in Business Administration Thanks in advance! Aline doesn't have any reviews yet.